Revaluation Results For UG & PG May / June 2013 is Announced by Anna University for who are Applied for Photocopies and not published Revaluation Result on 10.09.2013 is Published today on the same link. For Example, MCA & MBA Students got their Photocopies before 10.09.2013 and their Revaluation Result is Announced Today Only. 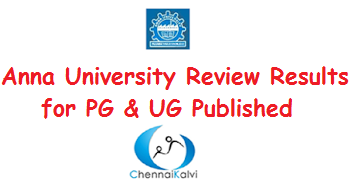 Revaluation Results For UG & PG May / June 2013 is Announced by Anna University. Revaluation Results are Expected soon. Photocopies of PG Papers are already reached to most of the colleges. If you applied for Photocopies, you may check with your colleges. Anna University UG Results (2nd Semester, 4th Semester, 6thSemester and 8th Semester) for May-2013 has published on 01.08.2013. Normally in Anna University Revaluation Result is helping approximately 10% of students to passing the exams. The Last Date for applying the Revaluation for the Result is 08.08.2013 is already over. So, as usual lot of the students are applied for the Revaluation and waiting for their results with confident. Most of the formalities are completed in the UG revaluation works and the revaluation results can be published any time. But, Anna University is collecting all the first year students data (All personal and educational details like Photos, Signatures, Address, Caste, and 10th, 12th Mark Details, etc..) thru the AU web portal coe1.annauniv.edufrom all the 570+ affiliated institutions. So the Anna University Web portal is always busy to access. The Portal Entry Last date is actually ended by yesterday(31.08.2013) and still many institutions are not completed that works, that work is extended up to 5th September. So, the conclusion is Revaluation Result is expected within 10th of September. Note : The Expected Result Date is unofficial and it may be differ due to decision of the AU COE. All the Best to All Revaluation Applied Students.